Bitter melon is very bitter, but I suspect cocoyam doesn’t taste like cocoa. It’s time to recommit myself to a lot of things, including this blog. Even though nobody seems to care or notice that I haven’t drawn a comic in over 3 weeks, I remind myself that this blog is for you. It’s for me. You just happen to be lucky enough to read it. There are going to be some Dragon Comics soon. For this gratitude, which was supposed to go up last week, I was thinking about all the foods in the world I haven’t tried. Like a lot of kids, I was a boring and picky eater with a very limited repertoire. A lot of people would still consider me picky—I largely avoid grains, particularly wheat, and white sugar, and won’t eat anything made with ground or preserved meat, or most fast or junk foods—but I’m fairly open to trying new things, especially if they come from older and healthier cuisines. Lately, we’re obsessed with West African cuisine, particularly fufu and peanut sauce. It’s delicious, and if you haven’t tried it, especially with goat, you’re missing out on some of the good things in life. For a little pick-me-up it’s fun to go to new grocery stores, especially ones run and patronized by immigrants. There are 100s or 1000s of fruits and vegetables you’ve never tried, with which other people are familiar, and now that we have the internet there’s no excuse not to try them. In all honesty, I tried the bitter melon a few different ways and it was too bitter for me, but I’m glad I tried it. You never know what you might enjoy. The cocoyam I’ll try to work up into something tonight. My gratitude is for the existence of and will to experience countless new foods. This entry was posted in gratitude and tagged being thankful, cooking, food, grateful, gratitude, thanks on April 18, 2017 by littledragonblue. Seriously. You should try it sometime. You’d be surprised how well it works. Right now I’m grateful that I actually finished this comic. After 4 days of nonstop holiday cleaning, I find myself sick like a little kid, with an actual fever and everything. So if this comic makes no sense, blame it on my 100.5° temperature and my inability to breath the air that remains after you run the cleaning cycle on an oven where you regularly roast entire chickens. Not to mention my allergy to pretty much every cleaning product ever. My house is now toxic to me, and the sad part is that it doesn’t look substantially cleaner than it did before we started. This is another comic that’s more about me than the kids. In reality, the Girl is something of a Pollyanna, with a strangely sunny disposition and a powerful ability to love her family. Although she also loves butter, sugar, milk, salt, cheese, and Taylor Swift. The redundancy of dairy products is due to the fact that The Man really did grow up on a dairy farm. Not sure how many more comics I can write this week, since there’s family coming and also I am now the walking dead. We’ll take a little break for the holidays. Web traffic drops off like crazy at the end of the year, unless you’re selling holiday gifts. 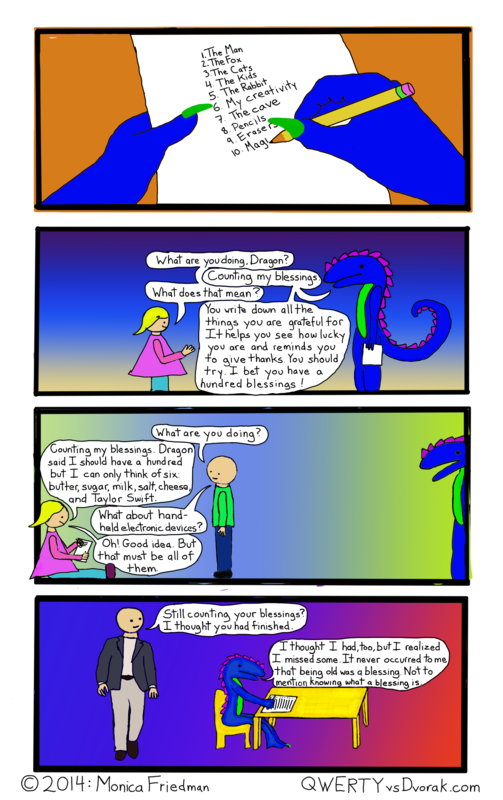 This entry was posted in Comics, Dragons and tagged being thankful, blessing, comic, dragon, grateful, gratitude, webcomic on November 24, 2014 by littledragonblue.